We invite you to join this two-day event that brings JS experts together to share their experiences, expertise, and enthusiasm. 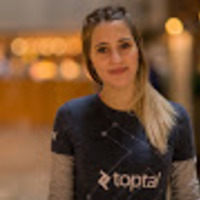 The event will be a great opportunity to connect with other Toptalers and meet some core team members who are in town for the conference, including Gabriela Casagranda, Technical Sourcer at Toptal, Stefan de Leng, Toptal’s Business Talent Sourcer, and Ivan Alvarez, our Community Leader in Medellín. For a closer look, please see the website or contact Victoria Marafetti.